... this would be it! 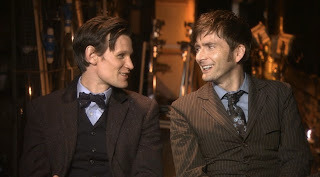 While on the hunt for the perfect Matt Smith bow tie, a good friend of mine has found an interesting maker on Etsy.com, called TheDirectorsCabin. As well as a small range of Eleventh Doctor bow ties (see right) they also do a number of other Doctors including the Fourth and Fifth, plus several abstract Doctor Who related patterns. But the ones that caught my eye from a Tenth Doctor point of view were a number based on his iconic brown pinstriped suit! I find it interesting that one of the bow ties is the same colour as the old JoAnn linen fabric which was around many years ago. The thing I like about the choice of tie for the Tenth Doctor’s appearance in the 50th Anniversary Special is that it’s a cheap and cheerful cosplay option. After initial fluctuating stock, it is still possible to pick one up for the original £14 price tag. 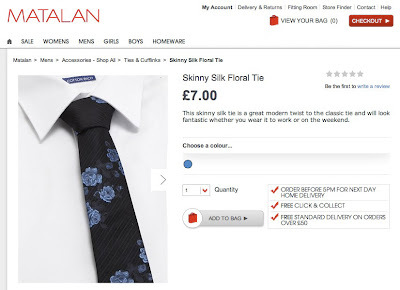 Looking into the future, when the tie is finally discontinued, there will no doubt be copies available, which ironically will sell for two or three times the price of what they are replicating. Well, someone has spotted that you can already get a knock-off version of the tie - for HALF the price - from Matalan! The name of the tie is a subtle twisting of the St George name - Skinny Silk Floral Tie as opposed to Brown Jacquard Floral Slim Tie. Being one of those commercial copies of a rival’s design, it does naturally differ notably in its appearance. 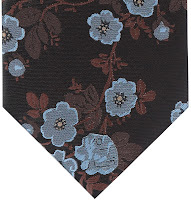 The flowers do, however, have a distinct resemblance to the St George tie. There is no doubt that is what they are aiming for! Like the original there are dark leaves under the flowers, though not as bronze as the St George. The flowers are in distinct bands, not unlike the St George tie worn in Utopia! For £7 you can’t go wrong, and as a curiosity, I can’t resist ordering one.